When it comes to photography, you can do a lot with a little light. Adding light into your images offers many creative possibilities: add a sparkle to someone's eyes, make highlights shine, enhance an atmospheric effect, trace a constellation in the sky, render a cinematic special effect, and much, much more. In short, you can enhance the center of attention in any image or create a new one. Adding light into your photographs after exposure just got easier on your iPhone. 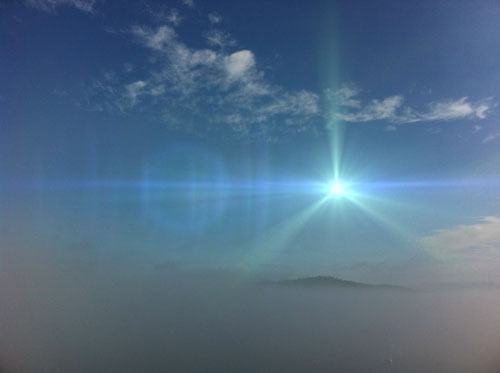 Brain Fever Media makes two apps that can add light fx to your images: Lens Flare and Lens Light. Lens Flare offers 45 different effects -- mostly star patterns, some edge flares, and a few linear streaks. Lens Light offers 54 different effects including rays, spotlights, streaks, scratches, and even suns, moons, and lightning. I'd like an option to purchase a single higher priced bundle of both apps. The same interface in both apps is almost as graphically pleasing as the effects these apps render, making them a joy to navigate. The apps are easy to use. 1. Select an effect with one button. 2. With another, you can activate a brightness slider. 3. Position, size and rotation are easily adjusted with simple finger gestures. The Lens Dust feature adds artifacts, distressing images for an added touch of realism. The ability of this feature is limited and so useful only for quick and dirty applications. If you can afford the time, layer in your own dust patterns, whether captured photographically or rendered by other apps like ScratchCam, by blending a separate exposure with another app like Image Blender or for more control PhotoForge2. Unfortunately, you can't control the separate lens artifacts independently. You need a professional fx program like Knoll's Lens Flare Pro to do this. By positioning an effect carefully you can separate the various artifacts somewhat. So you can gain a little more control, by planning to layer and mask a processed version with an unprocessed version. The Render (Add Flare) option allows you to add multiple flares. This will render the first effect of your choice in its current state and then allow you to choose a second effect, without having to leave the app. Save Flare Only enables you to render any effect on a black background. You can then blend the separate effect with more control in another app like PhotoForge2 or a professional image editing app like Photoshop. The info button accesses a very good user guide. It's neither to short nor too long and as graphically pleasing as the rest of the interface. No matter how you use it, light attracts the eye. So be mindful of where you place light in your images. If you're not careful, you may misdirect viewers' attentions.